The Bright Sparks once again lived up to their name as they came out tops at the Tendring District Council (TDC) Chairman’s charity quiz night for the fourth consecutive year. The Lions Club of Clacton-on-Sea held the event at the Princes Theatre in aid of the TDC Chairman’s charity appeal. More than 30 teams took part in the quiz on Friday night (18 January and raised a grand total of £1,100 for Tendring Community Transport. 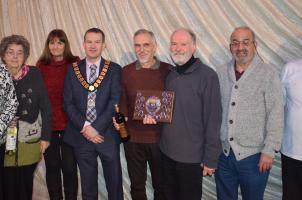 TDC Chairman Cllr Mark Platt said it was a brilliant evening full of friendly competition. “I’d like to thank everyone who came along and supported the event and to our quiz master Adrian Robinson for keeping the teams in check,” Cllr Platt said. The winning team was presented with the quiz shield and prizes, while there were also two raffles to help raise funds. Tendring Community Transport is a well-established and accomplished community transport scheme, which provides wheelchair accessible, door-to-door transport for people of all ages.